Visit any U.S. Aéropostale store location or Aéropostale online and receive 30% discount on one full priced item from The Fall Collection. To receive the offer in store use printable coupon, to receive the offer online use promo code THIRTY at checkout. Offer is valid through August 7, 2016. Source of the information is Aéropostale. 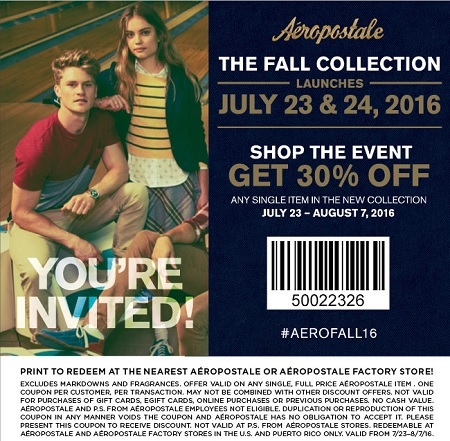 For more details visit any Aéropostale store location in the U.S. or Aéropostale online.